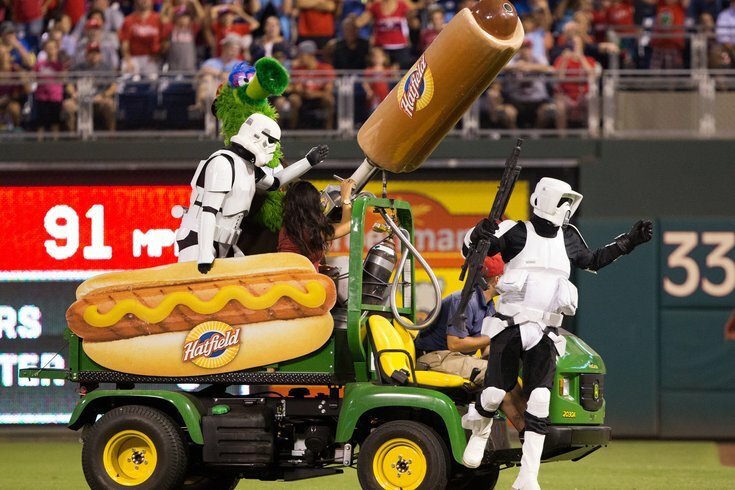 The Phillie Phanatic and some storm troopers shoot hot dogs into the crowd during a 2016 game against the Miami Marlins. It was just another day at the ballpark for one Phillies fan with particularly good seats near home plate – until the Phillie Phanatic appeared, riding on his flying hotdog launcher. Plymouth Meeting resident Kathy McVay left Citizens Bank Park with a black eye while attending Monday's Philadelphia Phillies game against the St. Louis Cardinals, struck not by a foul ball but by a flying hot dog shot out of the Phanatic's cannon. What the heck happened to this Center City trash can? McVay, who was already suffering from a torn rotator cuff, limiting her ability to move her shoulder or lift her arm, was unable to block the flying food that was headed straight at her head. Before she knew it, her glasses had been knocked off, blood was flowing, and she was being ushered off to First Aid. Though the Phanatic has been throwing free hotdogs to fans for years, McVay's is the first known injury resulting from the tradition. McVay was given a CAT scan and X-rays at Einstein Hospital later. It was determined she had not sustained a concussion, just a severe black eye. "At least it's funny," she said to NBC10. "It's a story I can tell people. My only thing is just to warn people just to be careful." McVay said she's a big Phillies fan and doesn't plan to file legal action, though her eye currently has a hematoma. The injury, she told 6ABC, is "going to get worse before it gets better," extending down her face and requiring ice every 20 minutes. The Phillies' attempt at recompense? Free tickets to a future game. Preferably in the nosebleed section.